I had previously purchased the audio version of this same title in which Wilson himself is "lecturing" to a group of school aged children on Narnia. The book, What I Learned in Narnia, is a cleaned up version of the transcript of his lectures. (If you are an audio learner, you might want to consider the lecture series which is available through Canon Press & Amazon both.) I actually began listening to the audio lectures before I started reading this book and made some notes from them which I plan on sharing with you next week. After I listened to the lecture series I read the book which, as I mentioned, is a cleaned up transcript, of sorts. I do think Narnia is rich with symbolism and practical life applications for the Christian. (You'll see some of these ideas and notes when I post my thoughts from Wilson's lectures of the same title.) However, you'd be putting the cart before the horse if you try to figure out all what Lewis was getting at before you read about where he was taking you to. Love the stories first. Engage with them. Then go back, read them again, and learn more. As I've mentioned before, every time I re-enter the world of Narnia I learn something new. This year's Narnia Challenge is no exception. I find myself pulling more out of the stories than ever before - in part because I am sharing them with my kids. 1. The applications that he draws from the stories and offers for our lives is very practical. I would have to say that his chapter on the confession of sin has been particularly meaningful this time around. Let's just say that a two year old and a four year old, learning about life and obedience, are given ample opportunity to learn how to confess correctly. As I've been regaling my children with examples from Narnia, I've been learning to confess quickly myself as well as how to keep short(er) accounts. If you think about it, most adults these days do a pretty stinky job at confessing sins and taking personal responsibility for their actions and words. Look around you. You'll find an example quick enough. (Hey! You might even BE the example!) Wilson highlights particular characters and their reactions to certain situations when discussing owning our actions and behaviors and confessing when we're (over)due for it. 2. I like this book because he originally gave it as a series of lectures to school aged children. However, he did not feel the need to dumb down his message for the younger audience. Instead of speaking in one syllable words and interrupting his thoughts with words like "cool, hip and dude" he speaks directly to human beings. (I just finished reading a devotional about Narnia that was written to teens which was so full of slang that I was completely put off.) Wilson could have "talked down" to his reader/listener but instead he assumes that the listener has a brain and knows how to use it. If nothing else, he inspires them to think deeper thoughts and seek understanding. I appreciate that. I'm very happy to tell you that Canon Press has offered TWO copies of What I Learned in Narnia to two readers here at Reading to Know. If you would like to be entered into the contest, simply leave a comment below. This contest is open to U.S. Residents only and will remain open through Thursday, July 28th. THIS CONTEST IS NOW CLOSED! THE WINNERS (as selected by Random.org) are: #20 - Laura Hartness and #5 - Shonya! Congrats! Thank you, Canon Press, for shooting a copy of this book my way and for offering some additional copies up to two of my readers. I have added this to my list of ideas for gifts for my husband! I think we'd both enjoy it, but I definitely need another full read-through before finding out What I Learned in Narnia. He is likely ready though. This sounds like a good read. We are big Narnia fans here. I definitely want a chance at this one. I'm in Dawn Treader right now. I love Narnia and I would love to have this book. This sounds good. Count me in! I would love a copy of this book! I have read the Narnia series aloud to my children twice over the years and learn more each time. I have a great respect for Douglas Wilson, and I'd love to read this book! I would love to read this book. Your description of it makes the book sound like a good read. Of course I'd like to read this one! This sounds like such a wonderful book. I would love to read this, and learn more about the series. Great book to use with 2 sons! Pick me!! I would love to read that one! I love that -- a book as a "conversation between two friends" about something they love. I'm in! I love the Nardia series of books and the movies, and so does my grandson. 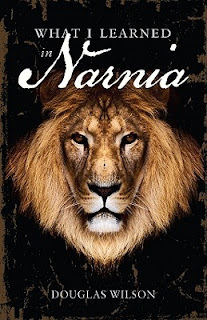 What I Learned in Narnia would be a great gift for my grandson. This sounds like a perfect book to read once I finish the series. Only three books left for me! :( I might cry. I'd love to win-- please enter this Narnia fan into the contest! Sounds like a great book! I've read all the books except 'The Last Battle' with my kids and this would be a great resource to share with them. Yay! Thanks for holding the contest-- can't wait to read it! Entering to win. I do think that many books are a waste of valuable time when there are so many GREAT classics out there. Narnia is great!